Perhaps you’re also looking to gave some fun while in France? You can’t miss out on our Free Paris Night Guide where we have tons of recommendations on Paris’ night scene! Just four hours away from Paris, in northwest France, the delightfully preserved Dinan seems to be from another time. All things considered, little seems to have changed for centuries. The lovely medieval town center features beautiful cobbled streets, artist studios and especially memorable houses. Dinan is undeniably one of Brittany’s most charming towns. The 2 miles of protective stone ramparts formerly kept the town safe from pirates in the 13th century. Walk through the English Garden to St. Catherine’s Tower for a stunning view of the old port. Continue on to the Place du Guesclin, the sprawling town square. Merchants have filled the square for over 700 years to sell their crafts and produce. 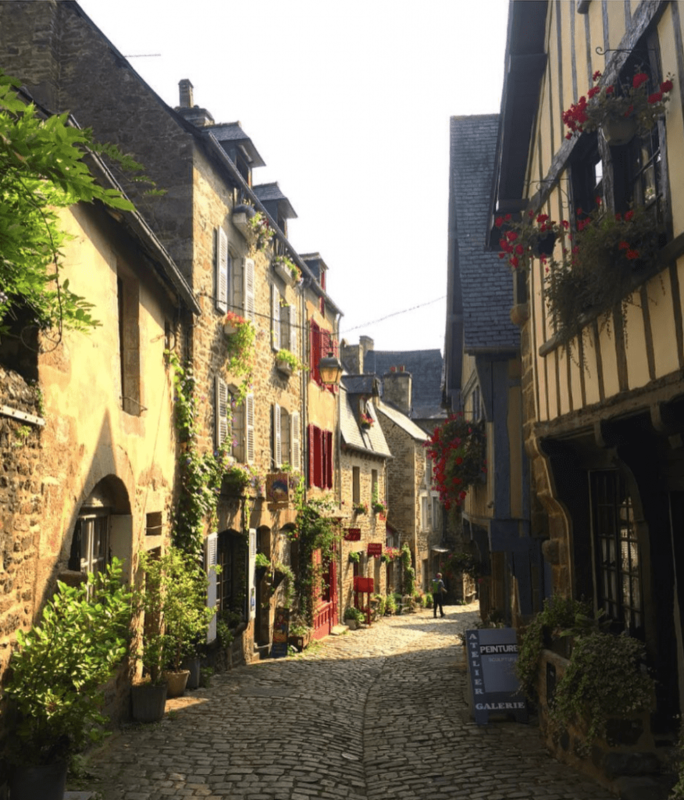 Lastly, follow the steep rue du Jerzual back into town to enjoy some local favorites, including cider, traditional galettes or a deliciously fresh seafood lunch. Visit in the spring or summer to enjoy the coast, sandy beaches or even sail to the nearby islands. Dinan is a charming town at any time but especially lovely during the spring and summer months. However, if you plan on visiting in winter, try and go on a clear day to fully enjoy the views over Dinan, the port and the coast. 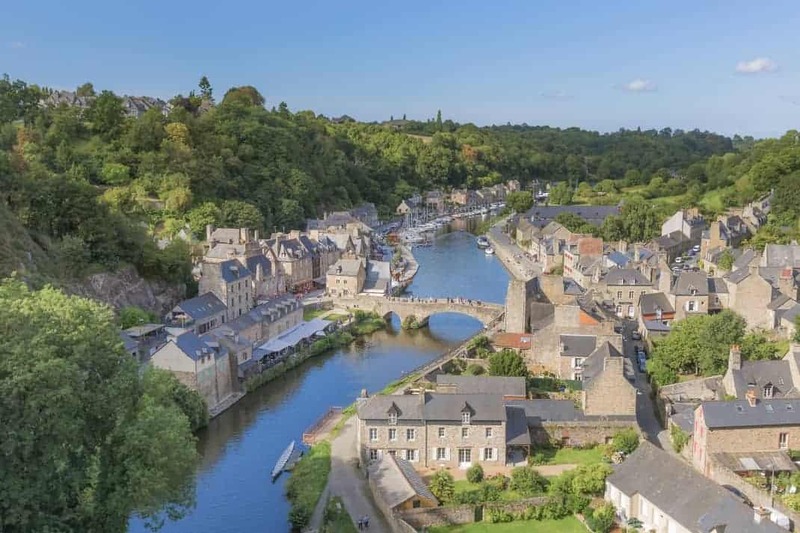 Dinan is an ideal day trip destination with its walkable cobblestone streets. Most of the main sights can be seen in just one day. Although, if you want to fully experience the town, the local cuisine and nature, we recommend spending the night for a relaxing weekend in what is often called Brittany’s prettiest town. Being a coastal town, Dinan features a relaxed and casual atmosphere. No need to dress up! Certainly do pack for the season and for any outdoor activities you plan on doing (hiking, sailing, etc.). If you want to get into the spirit of Brittany, you can even wear the classic marinière, or striped shirt. As Dinan is a coastal town in the northeast of France, it is generally cooler than Paris. The average temperature from June to September is around 21C while it dips to about an average of 12C in the cooler months of October and November. The winter months can go as low as 5C. Here is the updated weekly weather forecast. Dinan’s old town is full of narrow streets which will make it seem as if time has stood still. 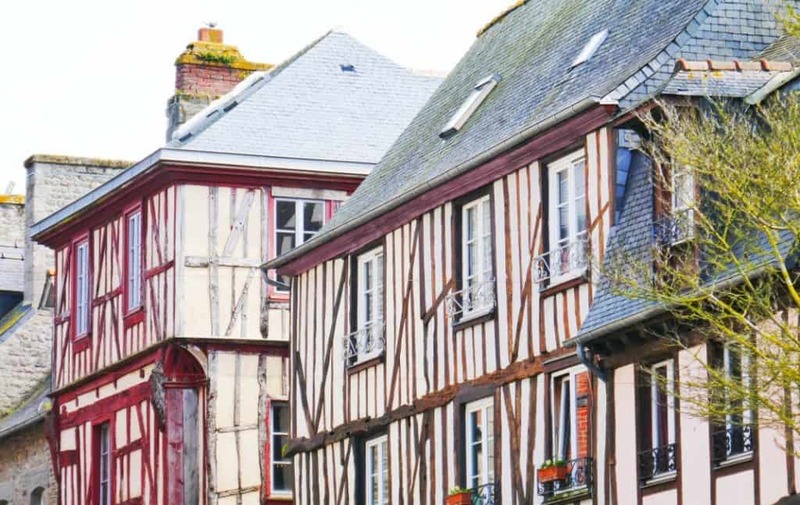 The quaintest part is Place des Merciers where you’ll find the best examples of the town’s half-timbered houses; just opposite is the pedestrianised Rue de la Cordonnerie, also known as ‘thirsty street’ as it has nine bars. Château du Dinan, built from 1382, consists of a keep and is also known as Donjon de la duchesse Anne (Keep of the Duchess Anne). 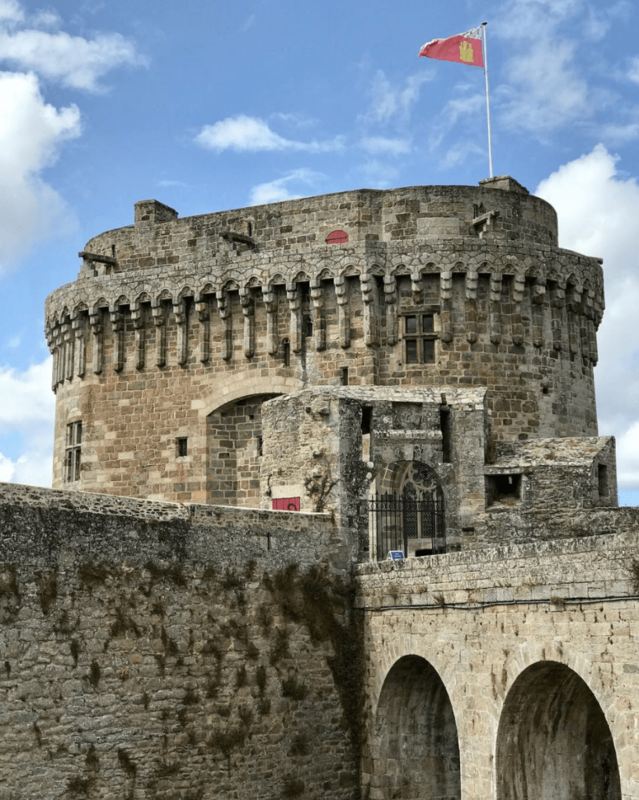 This was built by John IV of Montfort, Duke of Brittany and once served as a dungeon and jail but now house the Musée d’Histoire de la Ville de Dinan which chronicles the evolution of the city from prehistoric times to the early 20th century.. If you don’t suffer from vertigo, I recommend you go up to the Dungeon top platform as it boasts prime views of the city and its surrounding countryside. The Basilique Saint Sauveur is a huge cathedral built in the early Gothic style. The charming stained glass windows line the large interior, pocketed with cozy alcoves and small alters. It’s located right in the center of the city, at Place Saint Sauveur. 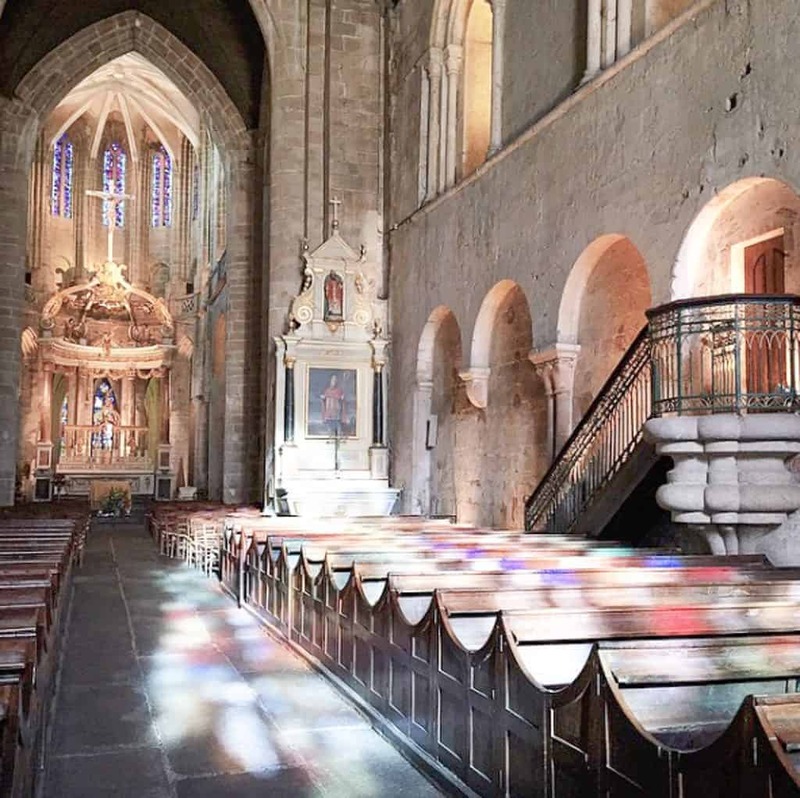 Make sure to stop by and savor the 700 years of history preserved inside the cathedral walls. After your visit to the basilica of Saint-Saveur, going to St. Catherine’s Tower is an essential step. The stone tower was constructed in the 13th century. The tower measures 16 meters high from where you can enjoy a stunning view of the old port and surrounding nature. Only certain sections of the city ramparts remain intact. Luckily, the tower is located in a relatively well preserved area and even offers a glimpse into the town’s medieval history. We think that visiting a town’s local market is a great way to really warm up to a city and get a feel of its true atmosphere. It’s a place where locals gather and go about their business. And who knows? You might just find something you’ll want to bring home! The area surrounding La Place des Merciers is where you can buy bread, cheese, pâté, fresh produce, and cuts of locally raised meat. You can also find leather, shoes, jewelry, and toys for the kids. The town also has a local open-air market on Thursday mornings at Place du Guesclin where local farmers and vendors sell their goods. If you’re visiting sometime in summer, we definitely recommend going to the annual market as one of the best things to do in Dinan! This event is usually held for one weekend in July and in August. Not only will local merchants be selling unique items, there’s usually some musical entertainment, too! 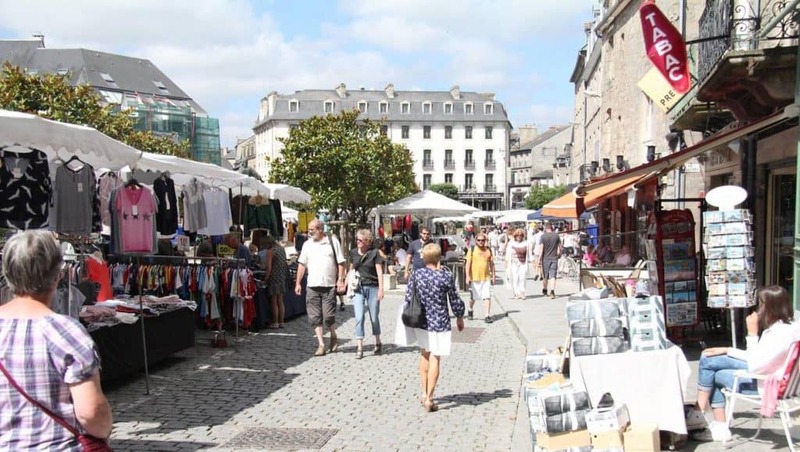 And if you’re interested to know about some more local markets in the neighboring towns of Dinan in Brittany, click here. 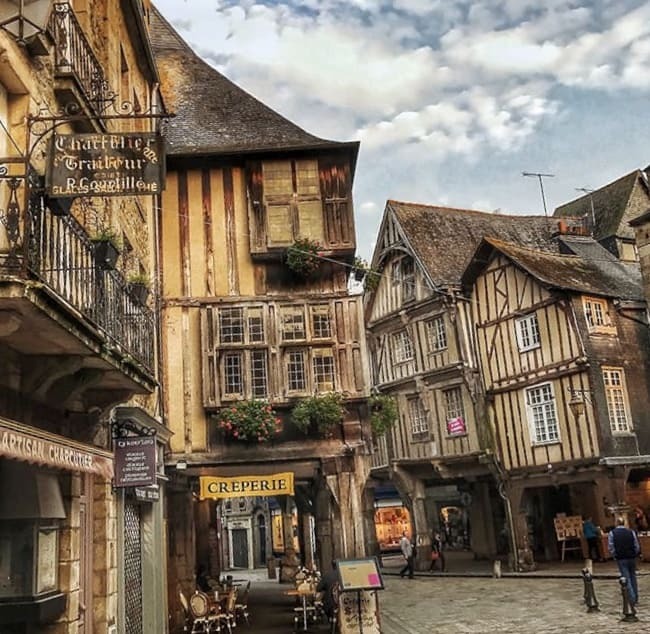 The rue du Jerzual is the most famous, as well as, the most photographed street in Dinan. It links the city to river Rance. The street has a slope of over 75 meters, so make sure to wear comfortable shoes if you plan on walking up it! It begins at the intersection of rue de la Lainerie and rue de la Poissonnerie and continues until the city gate. 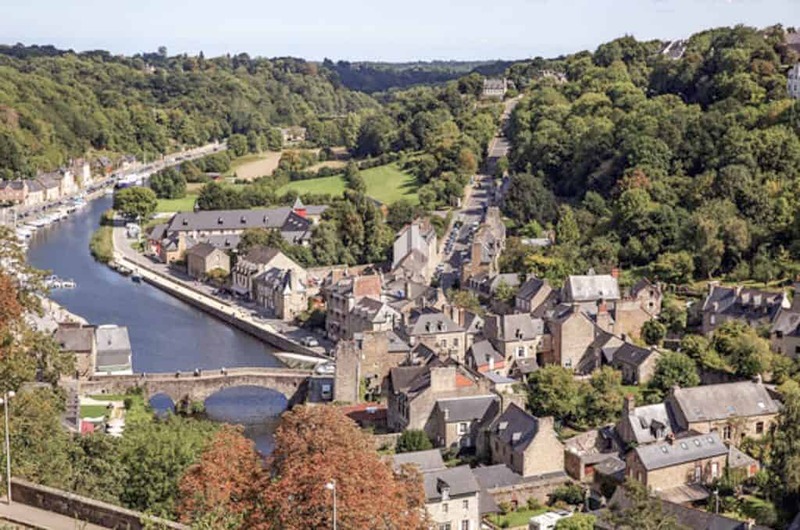 For more information and for local tours, visit the local tourist information center of Dinan. Traveling from Paris by car is a great way to get to Dinan! This is especially a great option if you’re traveling in a group as you can split the car rental and gasoline costs and it’ll come out cheaper than going by train. 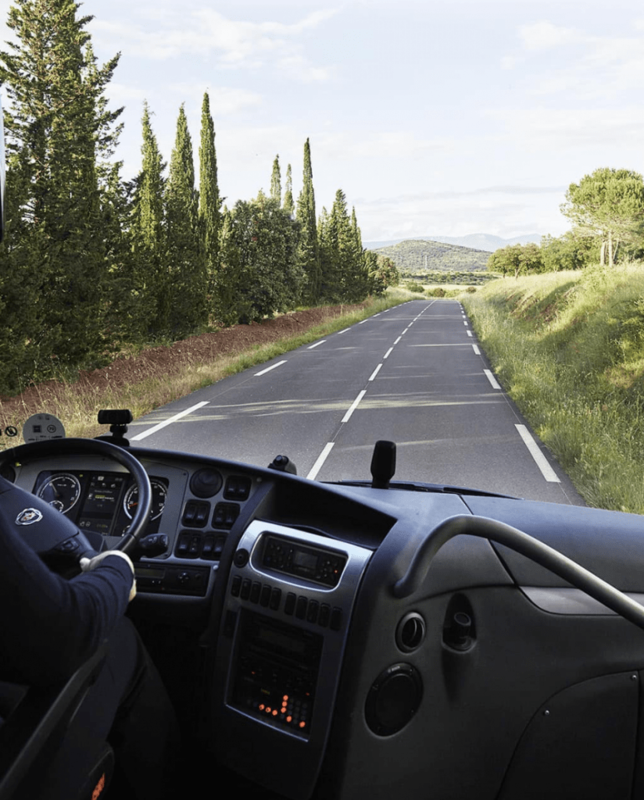 You’ll also get to pass by some big towns like Le Mans and Rennes where you could perhaps make some pitstops for lunch or a little bit of sightseeing! We have a complete guide to renting a car and driving in France. To get to Dinan from Paris by train, you’ll have to catch one from Gare Montparnasse and get off at the main station of Dinan. There are 9 trains that depart for Dinan daily with the first train from 7:40 am and the last train leaving at 5:57 pm. It’s quite practical and easy. Plus, it’s a good option if you’re traveling solo! There is also a bus option from Paris to Dinan, but as you might have already guessed, it will take a much longer time. The bus will depart from Paris Bercy Station but will only take you to Gare de Rennes from where you’ll have to take 2 trains to arrive to Dinan. The upside is, this is the cheapest option and a good option if you enjoy long trips on the road! 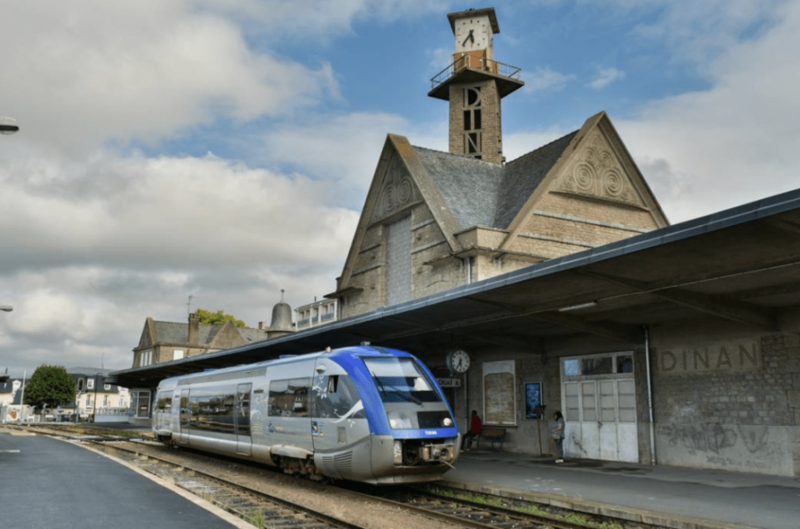 Travel time: 7 hours with 2 changes at Gare de Rennes and Gare de Dol de Bretagne. Click here to book your bus to Rennes.